You will see that several people (in this case, 50-ish ladies who are neighbors) sitting around a bench can ignite a revolution. It is a seed that can blossom into a domino effect, we hope, of more to come and eventually the larger Community Center for diverse age groups to be built. 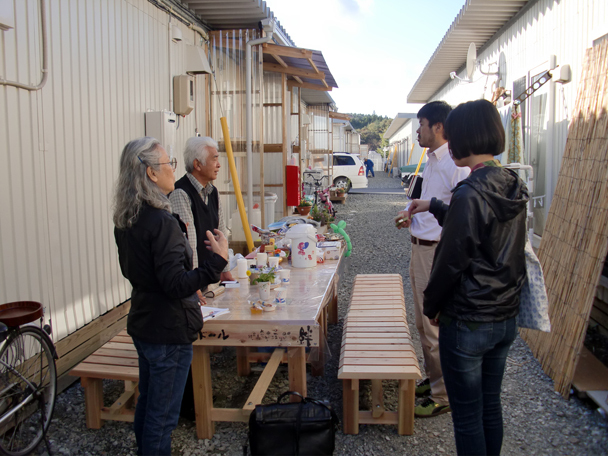 On our visit to the Heisei no Mori 平成の森仮設住宅敷地 Temporary Housing Site in Utatsu (about 200 dwelling units), Kiyomi-san, a friend of mine from Tokyo (a community activist with an NPO group) who happened to also be visiting Minamisanriku, introduced us to a group of women around a table in one of the starkly-defined alleys of the housing rows (in the photo, they had already moved away into one of their 4.5-mat rooms to be warmer, to sit around a kotatsu). These neighbors found this outdoor bench as a social gathering place, essentially transforming their daily activity beyond their anonymous boxes. What they, then, asked us was to design a roof to prepare for the soon-to-arrive snow and cold rain, and to be warm enough to sit around during the winter: outside ! So, this will be our first “mini community center” project. We are giving ourselves 2 weeks to design, get the materials, and complete the construction by Nov 6th, with minimum cost, volunteer labor, and eager clients. If we pull this off, and we must…. 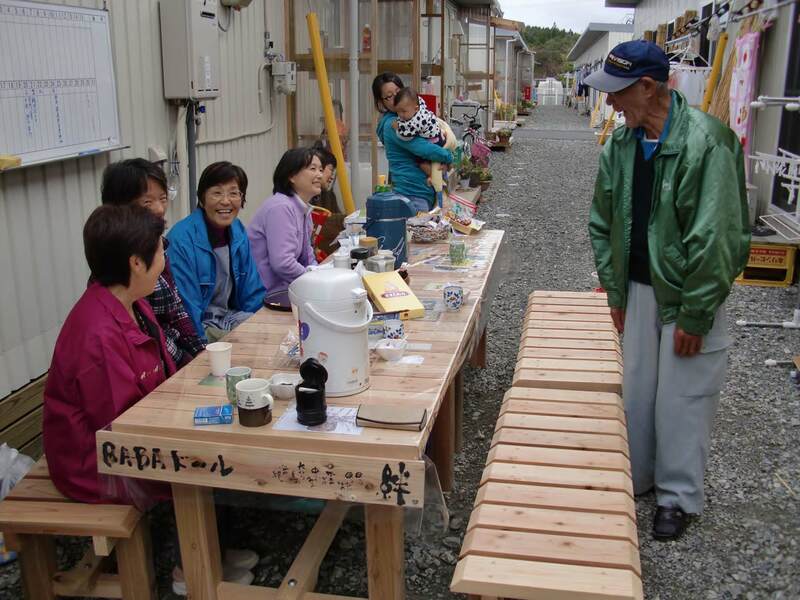 it can only add to the impetus, attention, and the demand by the residents, public officials and would-be-donors, all of whom we need to achieve our goal towards the building of a larger community center – now, hopefully at this Heisei no Mori community – which we will certainly continue to be working on in these next few months. So, join us if you can for a warm celebration on Nov 6th. Cheers/kanpai !! This entry was posted in news and tagged Heisei no Mori, project, shelter, Shun Kanda, Utatsu by admin. Bookmark the permalink.